Image credit: 3 Nations Brewing Co.
Nearly two years after establishing itself in Farmers Branch, 3 Nations Brewing Co. has announced the opening of an onsite taproom. Up until now, 3 Nations had only been open for monthly tours, but that will change beginning this weekend with a grand opening bash to be held on Saturday. 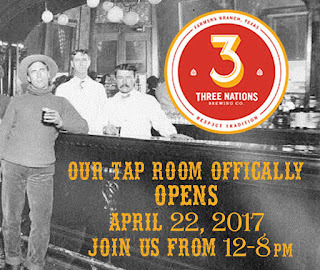 The event, which runs from 12-8 p.m., will feature food, live music and 11 beers on tap. Regarding the beer, in addition to 3 Nations standards like American Wit, GPA, Mango Smash IPA and Texas Gold, the lineup for the party will include two brews created in collaboration with Hop & Sting Brewing Co. One of these will be Double GPA, a self-explanatory offering, while the other will be a saison infused with whole tamarind called Sobra La Cima (i.e. Over the Top). On that note, some may not be aware that the two companies recently entered into an alternating proprietorship agreement. Pending the issuance of a license from the TABC, this will allow Hop & Sting to brew part time at the facility currently occupied by 3 Nations. It's a pact that makes sense in more way than one, if you consider the history behind the building and those involved. The assets, of course, were once owned by Grapevine Craft Brewery. However, once that company shifted operations to Grapevine, 3 Nations owner Gavin Secchi took over the building and its equipment prior to debuting his brand in July 2015. Now, Secchi will be sharing space with Hop & Sting founders Brian Burton and Jon Powell, both of whom worked at Grapevine prior to its move from Farmers Branch. In other words, Burton and Powell have prior experience working with the system currently in place at 3 Nations. As for the taproom, according to a press release, operating hours will be as follows: Thursday 5-9 p.m., Friday 5-10 p.m. and Saturday 12-8 p.m.
originally sat atop the roof of the city's Magnolia Hotel (© Brian Brown/Beer in Big D). 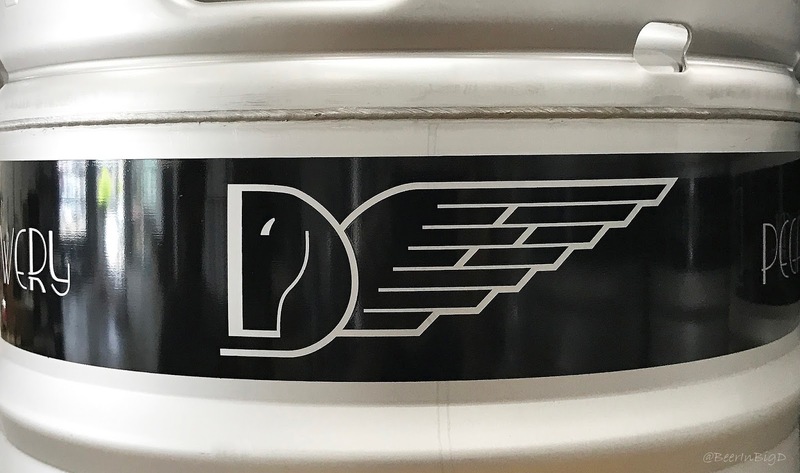 It's been over 20 months since a new brewery opened in the City of Dallas, but that ever so slight lull ended last week with the start of operations at Pegasus City Brewery. Located steps away from the western border of the Design District, Pegasus City is the brainchild of Chris Weiss and the husband-and-wife team of Will and Adrian Cotten. All three reside in The Cedars, which is where the trio first hatched the idea to start a brewery in late 2014. The catalyst, according to Weiss, being that The Cedars is a neighborhood somewhat bereft when it comes to craft beer. "Our local liquor store basically stocked the kind of beer that comes in 40-ounce, single serving cans," says Weiss. "You might find a few selections from the larger, more well-known craft brands like New Belgium or Sierra Nevada, but that was about it. So, for us, brewing was a way to bring better beer to our community." Left: Back behind bright tanks and a line of fermenters sits Pegasus City's two-vessel, 15-barrel brewhouse (© Brian Brown/Beer in Big D). Right: Pegasus City branding features an Art Deco design motif. The style choice pays homage to key moments in Dallas history that occurred during Art Deco's heyday in the 1920s and 1930s. That time period encompasses both the installation of the iconic Pegasus at the Magnolia in 1934, and the expansion of Fair Park (which was said to have been transformed into an Art Deco showcase) ahead of the Texas Centennial Exposition in 1936 (© Brian Brown/Beer in Big D). Along those lines, the original intent was to open Pegasus City in The Cedars, but finding the right kind of real estate at an affordable price just wasn't in the cards. Yet, while the brewery may have ultimately ended up in Dallas, a connection to where the business got its start is something the partners will look to maintain. In fact, the brewery's "porch-approved" tagline speaks directly to the company's roots. "The apartment complex where we live has a spot that's nicknamed the 'back porch,'" explains Weiss. "We would be out there brewing and friends and family would stop by and try our beers. They seemed to appreciate them, which is how the 'porch-approved' slogan got its start." Easy Porter were highly-drinkable with a smooth finish (© Brian Brown/Beer in Big D). Naturally, recipes graduating from porch to production are what make up Pegasus City's core lineup, which consists of five beers: Sixth Floor Easy Porter, Cannonball Bold Amber (pending a name change), Highpoint Porch Ale, Texican Black Lager and Nine Volt Tripel. Seasonals are in the works as well, but they won't be doled out like they are at other breweries. "We're going for a non-traditional seasonal calendar," says Weiss. "We'll be releasing beers on holidays like Memorial Day, Independence Day and Labor Day. But, we're not doing anything Christmas-y (i.e. a spiced beer), we're not doing anything with cherry or chocolate for Valentine's Day, and we won't have any kind of pumpkin beer...at all!" Pegasus City will also dabble a bit in barrel aging, but taking a dip in the sour beer pool isn't something that's in the immediate plans. Overall, consumers should anticipate a line of easy-drinking beers that may feature a twist or two when compared to classic styles. As for when you'll be able to enjoy Pegasus City beers on your own porch, Weiss expects the brewery to be canning its beers within two months. In the meantime, look for Pegasus City products to be tapped at select accounts in the coming days. Beer will also be made available in the brewery's taproom, which Weiss says will be open six days a week (hours and an opening day are still to be determined). Beyond that, larger on-premise events will occur roughly monthly, once the proper permits are in place. 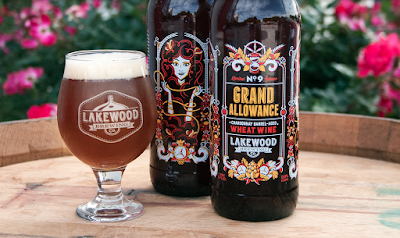 Image courtesy of Lakewood Brewing Co.
Lakewood Brewing Co. has released Grand Allowance, the ninth beer in the brewery's Legendary Series, and one which represents the second offering in The Trilogy, a miniseries of beers based on the legend of the Three Fates. 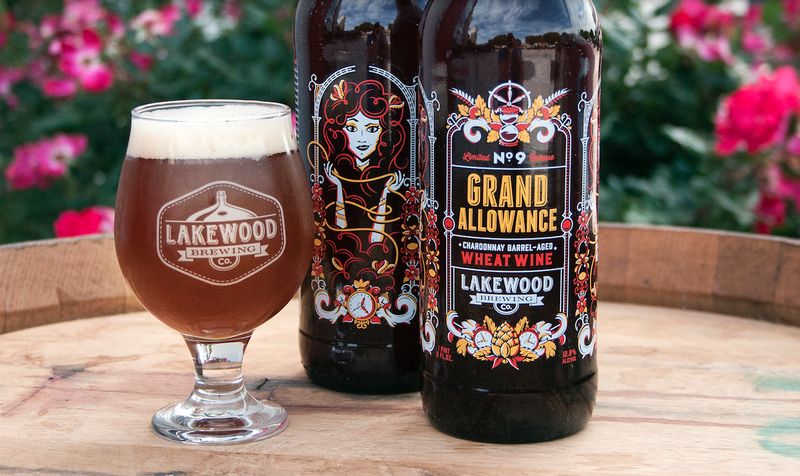 Grand Allowance (12.8% ABV) is a wheat wine aged in Chardonnay barrels. It's described as a full-bodied beer featuring fruity esters, honeysuckle aroma and a bready, sweet finish that complements soft oak notes imparted by the white wine barrels. "We're excited to continue this story and series of beers, showcasing the amazing qualities that come with barrel aging," says Wim Bens, founder of the brewery. "We love seeing how these different malt bases and barrel aging techniques bring a unique spin to each release, especially how they relate to each other." Within the confines of the legend of the Three Fates, Grand Allowance represents the story of Lachesis, one of three sisters who decided the fates of others through a thread of life. Lachesis measured threads spun by Clotho, and once she decided one was long enough, the thread was passed to Atropos to be cut. In that way, Lachesis determined the allowance for a certain being's time on earth. As for the beer, a press release states that Grand Allowance will be available on tap and in 22-ounce bottles. Look for it in stores this week. Image credits: Armadillo Ale Works, Collin Lewis. 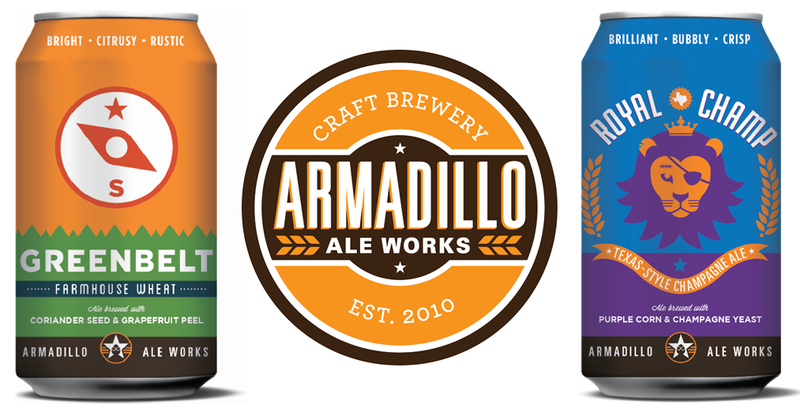 Followers of Armadillo Ale Works have reason to celebrate, as cans of a fan favorite are set to return to local shelves alongside a brand new brewery offering. 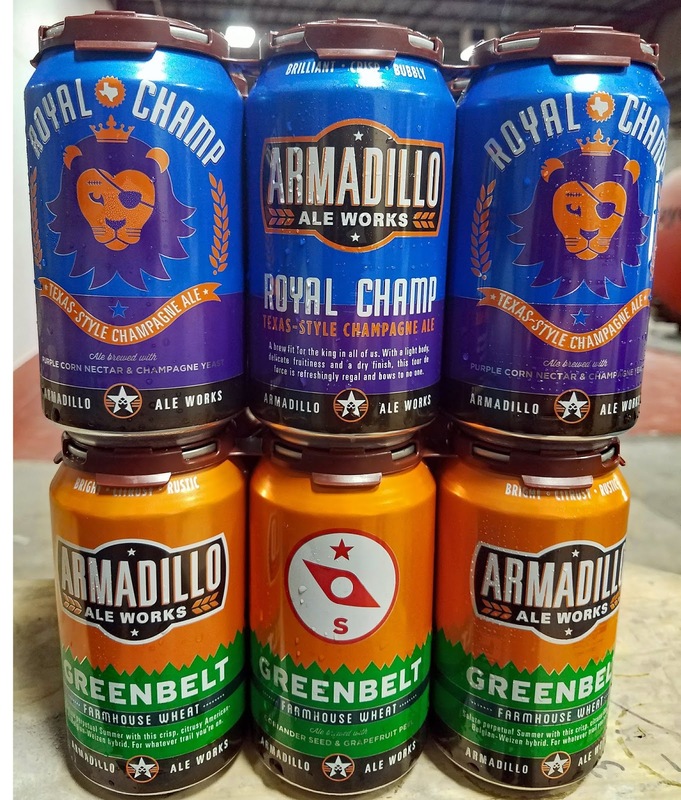 Greenbelt Farmhouse Wheat and Royal Champ Texas-Style Champagne Ale will ship to distribution on Friday, April 7, otherwise known as National Beer Day, with retail deliveries expected to commence the following week. 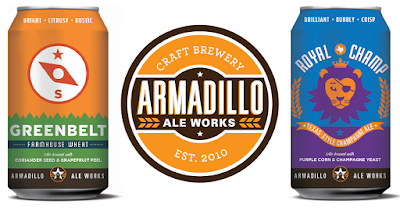 The beer returning to packaged form is Greenbelt Farmhouse Wheat, one of Armadillo's original products, though consumers may notice a slight alteration in its branding. What was once Greenbelt Farmhouse Ale is now Greenbelt Farmhouse Wheat, a change founders Yianni Arestis and Bobby Mullins say was made to better set expectations for consumers. "Greenbelt is still the same beer, we just decided to re-brand it," says Arestis. "Since it's a saison/hefeweizen hybrid, putting 'wheat' in the name will better communicate the beer's primary ingredient." ABVs of 5.2% (Armadillo Ale Works). As for what's new, that would be Royal Champ Texas-Style Champagne Ale. Brewed with purple corn and fermented with champagne yeast, the choice of the beer's off-the-wall ingredients was driven by a desire to add more complexity to a classic cream ale. "Royal Champ started out as a cream ale, but Bobby wanted to make it more interesting and flavorful while keeping the easy-drinking qualities of the style," explains Arestis. "The purple corn works with the champagne yeast to achieve the desired body, mouthfeel and ABV. These ingredients also combine to give the beer a unique and slightly fruity aroma, along with a hint of rose gold appearance and a dry finish." The fact that both beers are seen as highly quaffable makes each an ideal fit in cans enjoyed by craft beer drinkers on the go. That made for an easy decision as to which of the company's current and future offerings would be picked for a packaging re-launch. Of course, in the case of Greenbelt, demand was a consideration as well. "Since our return to the market, people have been asking when they could get Greenbelt in cans again, so we knew it had to be one of the beers chosen for the launch," says Arestis. "As for Royal Champ, we think it's going to be our most accessible beer, meaning someone who likes craft beer can take it to a BBQ or pool party and know that their 'non-craft' friends can also enjoy it. 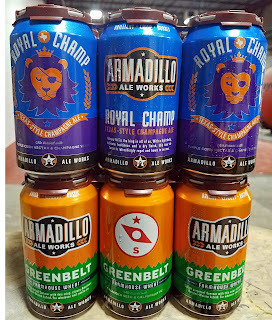 So, like Greenbelt, we feel like Royal Champ is a sessionable go-to beer that will appeal to craft and non-craft beer drinkers alike." Oak St. Drafthouse, Denton - 6-10 p.m. Dot's Hop House, Dallas - 12-4 p.m. Brewed, Fort Worth - 6-9 p.m. List of retailers: The Bearded Monk, Central Market, Choice Beverage, Eskimo Hut Denton, Lone Star Beverages, Lone Star Taps & Caps, Metzler's BBQ, Midway Craft House, Midway Mart, Paradise Liquor, Spec's, Total Wine and Whole Foods. Image credits: Brewvolution, Avery Brewing, Tupps Brewery, Four Bullets Brewery, Independence Brewing Co. 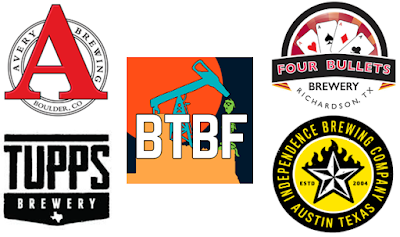 Sitting down to sort through this year's inventory of offerings at Big Texas Beer Fest (BTBF), my attention was drawn to one thing in particular - 500 beers. The beer list was of a similar magnitude in 2016, which means that remarkable tally has now sustained for two years in a row. What's also maintained is the quality among the selections available. Whether you be a barrel head, hop head, sour head, or someone simply looking to harpoon a few whales, there were (and always have been) more than enough choices to satisfy all manner of craft beer craving. For me, though, my approach to BTBF and other like events has never wavered. Show me what's new and what's different, for I navigate the amber waters of a festival on an endless voyage of discovery. As for what I uncovered on this most recent journey, a favored foursome and a few honorable mentions are noted below. Avery Apricot Sour: Soon to be on local shelves as a bomber-based year-round product, Avery's Apricot Sour was my favorite beer of the day. A veritable orchard of apricots saturates the senses, with the sweetness of the fruit finding a near perfect balance with the beer's level of lactic sourness. Four Bullets Box Cars Black Porter: What it is - a smooth, easy-drinking English-style porter with light roast and a hint of chocolate. What it isn't - barrel-aged, infused or inoculated in any way, shape or form. In other words, Box Cars is simple and stylistic, and sometimes it's nice to find some calm amidst the storm. Independence Illustrated Man: Solid, approachable sour with a burst of berry fruit flavor and a moderately tart finish. And, on top of that, I can't help but love the fact that the beer's name and can design are inspired by a favorite book from my favorite author, Ray Bradbury. Tupps Saison: The title doesn't tell the whole story, for this is no ordinary saison. It's big, it's bold, it's peppery...and it's good. It's also a "super saison," according to the BJCP style guidelines. That's because Tupps Saison has an ABV of 9.4%, though the phrase is also fitting considering how the beer presents on the palate. Also notable: 3 Nations Mango Smash IPA, Armadillo Ale Works Royal Champ, Big Bend Total Commitment, Good Neighbor M'Rye Ah, Lakewood Grand Allowance, On Rotation Irish Coffee Milk Stout, Rabbit Hole School of Bock.